O’Brien, Zuckerman announce run for leadership of the Teamsters | Fight Back! Fred Zuckerman speaking to a crowd of Boston Teamsters about his intention to run with O’Brien for top leadership of the union. 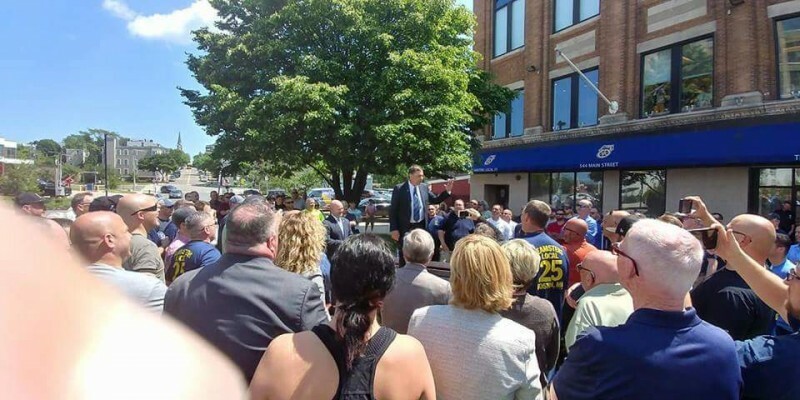 Jacksonville, FL – Standing in front of more than 100 Teamsters gathered in a Boston, Massachusetts park, May 29, two Teamster leaders announced plans to run together for the leadership of the International Brotherhood of Teamsters (IBT) in 2021. Sean O’Brien, president of Teamsters Local 25 out of Boston, announced he will join the Teamsters United movement as candidate for general president. Fred Zuckerman, president of Teamsters Local 89 out of Louisville, Kentucky, will run with O’Brien for general secretary-treasurer. The Teamsters United slate will challenge the current leadership of the IBT under Jim Hoffa Jr., who has presided over the union for nearly two decades. Ken Hall, the current secretary-treasurer of the IBT who won re-election last year on Hoffa’s slate, has announced his own candidacy. The 2016 Teamsters international election brought together fighters, leaders and activists from across the union committed to challenging the current IBT leadership under Jim Hoffa Jr. Out of this effort came the Teamsters United movement, which put forward a militant platform around fighting employers for better contracts, resisting concessions, reviving the strike weapon, organizing the unorganized in core Teamster industries, and more. Zuckerman ran as the Teamsters United candidate for general president in 2016, coming within 6024 votes of defeating current IBT president Jim Hoffa Jr. The Teamsters United slate won the vote total in the U.S. and among the nearly 240,000 UPS Teamsters, 70% of whom voted for Zuckerman. In the Central and Southern Regions, Teamsters United defeated Hoffa and elected six of its candidates as international vice presidents. Ponder was part of the Teamsters United campaign in the Southern Region, which defeated the Hoffa-Hall ticket handily in 2016. Teamsters United won the south by a vote of 10,789 to 8227 in 2016, electing John Palmer and Kimberley Schultz as the new Southern Region Vice Presidents – a sharp reversal from the previous election, when Hoffa easily won against a divided opposition slate. Since that time, Teamsters United has continued on-the-ground organizing around the country to win better contracts and fight back against contract concessions. They are currently pushing for a strong ‘yes’ vote for strike authorization among UPS and UPS Freight Teamsters. “The main fight right now is the battle for better contracts at UPS and UPS Freight,” said Gabriella Killpack, a UPS package car driver in Teamsters Local 222 out of Salt Lake City, Utah who campaigned heavily for Teamsters United in 2016. Killpack refers to the ongoing contract negotiations between the Teamsters, UPS and UPS Freight, which began earlier this year. The union raised a set of contract proposals brought forward by members to address the problems they face on the job. These included an end to forced overtime for package car drivers, monetary penalties for harassment, protections from automation and driverless vehicles, and higher wages for part-timers, among many others. Since that time, Teamster lead negotiator Denis Taylor has reportedly backed off most of the union’s major proposals and embraced many of the concessions demanded by UPS. After purging half of the negotiating committee opposed to concessions, Taylor called a strike authorization vote for UPS and UPS Freight Teamsters, which began on May 16 and will continue through June 3. The union will announce the results on June 5, a little under two months before both collective bargaining agreements are set to expire. O’Brien made national news in September 2017 when Hoffa removed him as the package division director in charge of negotiating the UPS contract. While he ran on Hoffa’s slate in the 2016 election, O’Brien reached out to Zuckerman and other Teamsters United leaders after the campaign and pushed for their inclusion on the UPS negotiating team. O’Brien’s removal as package division director puts him in good company with another Teamsters United leader. In 2012, Hoffa removed Zuckerman as carhaul director for fighting against contract concessions and challenging his slate in the 2011 international election. The news came as a surprise to Teamsters activists across the country, many of whom are working to turn out a strong ‘yes’ vote in the UPS and UPS Freight strike authorization poll currently underway. Members and activists flocked to social media, like the popular ‘Vote NO on the UPS Contract’ Facebook group, and discussed the announcement – and what it means moving forward. With the next international election more than three years away, Teamsters United has more immediate fights on its plate, like the UPS and UPS Freight contracts. But continuing to build the Teamsters United coalition for the 2021 election remains crucial. Recent Teamster history shows the importance of united action from union fighters and activists. In 2011, the opposition movement to Hoffa divided into two separate slates with different platforms. Hoffa easily defeated both and won re-election, allowing him and Secretary-Treasurer Ken Hall to push deep concessions like the UPS contract of 2013. Dave Schneider is a UPS Teamster shop steward out of Jacksonville, FL. Richard Blake provided research for the article.